Chanteuse Country US née Wilma Charlene Burgess, le 11 Juin 1939 à Orlando (Floride). 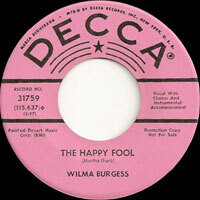 Wilma Burgess est décédée le 26 Août 2003 à Nashville (Tennessee). 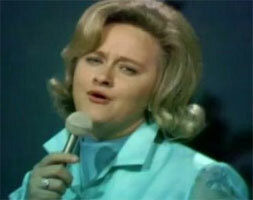 US Country singer born Wilma Charlene Burgess, on June 11, 1939 in Orlando (Florida). Following high school graduation she proceeded to Stetson University in Deland, Florida studying physical education. She had no interest in a musical career - although she had displayed her natural talent performing as a Pop singer on local television - until hearing Eddy Arnold in concert awakened her passion for C&W music. In 1960 a songwriter friend of Burgess persuaded her to go to Nashville to record some demos of his compositions. 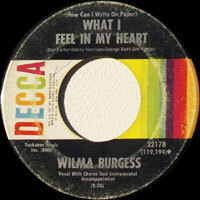 One of the publishers Burgess sang for asked to manage her singing career and Burgess cut her first single in the fall of 1962 for the United Artists label. Eventually Burgess came to the attention of Owen Bradley who heard in Burgess' voice the potential for a successor to the recently deceased Patsy Cline who Bradley had produced. Bradley arranged for Burgess' signing with Decca where she had her first session in June 1964. After three unsuccessful single releases Bradley had Burgess record the Ray Griff song "Baby" on 24 September 1965: the track proved to be Burgess' breakout hit reaching #7 C&W. 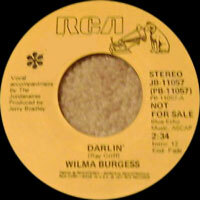 Burgess' expertise with teary ballads was further exemplified with the follow-ups "Don't Touch Me" (#12 C&W) and "Misty Blue" (#4) and logically her successful versions of these C&W classic tunes would have consolidated Burgess' position as a major player on the Nashville scene. However Burgess' versions of both "Don't Touch Me" and "Misty Blue" were both overshadowed, the first by the concurrent release of a more successful version of "Don't Touch Me" by Jeannie Seely - for whom Hank Cochran (then Seely's husband) had written the song. 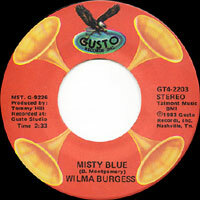 Then "Misty Blue" - handed down to Burgess after being rejected by Brenda Lee - was shortly established as a trademark song for Burgess' prime influence Eddy Arnold whose version in the spring of 1967 not only reached #3 C&W but became a regional Pop hit reaching #57 nationally. Continuing to record with Owen Bradley, Burgess placed seven more singles on the C&W chart but only the first two of these: "Fifteen Days" (#24) and "Tear Time" (#15) both 1967 reached the Top 40. 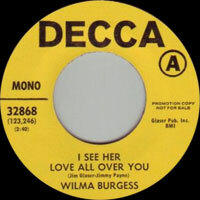 Burgess association with Bradley and Decca Records ended in 1971; that same year she signed with Shannon a label owned by Jim Reeves Enterprises (Burgess was a close friend of Reeves' widow Mary Reeves). 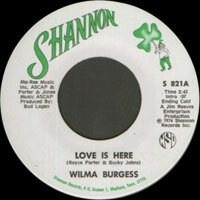 Five of Burgess' single releases on Shannon appeared on the C&W chart with the 1973 duo with Bud Logan "Wake Me Into Love" providing a on-off return to the Top 40 at #14. In 1975 Burgess left Shannon signing with RCA Records where her uneventful tenure lasted until 1978. In 1982 she ended her recording career with the album Could I Have This Dance on 51West a Columbia Records label. Later in the decade Burgess opened the Hitching Post - described as Nashville's first women-only bar - where she regularly performed. Burgess also worked on and off with Mary Reeves running the Jim Reeves Museum in Nashville. It has been noted by Jim Ed Brown that Burgess was also a decent poker player, having taken both Ernest Tubb and Tubb's bus driver's money while on tour together. Burgess was openly a lesbian and preferred to record love songs with no gender-specific references. She did sometimes agree to record songs such as "Ain't Got No Man" on condition that her producer Owen Bradley let her record a song she liked but he didn't. Wilma Burgess died unexpectedly Monday, August 26, 2003 at 4:05 a.m. at Centennial Medical Center in Nashville, after suffering a massive heart attack. She was 64, and had been hospitalized for a week for tests, and had seemed to be on the road to recovery. 1988 SP MICHELE 117 (US) . Misty Blue / ? 01/1996 CD MOE'S MIGHTY MINI 2714 (US) . Misty Blue / ?